A few months ago, my mother, sisters, and I started Campa Creatives. This creative venture is an excuse for us to do what we love (create!) and share the experience with our family and friends. We sell handmade arts and crafts as well as host events intended to bring together creativity, companionship, and inspiration. Campa Creatives is an opportunity for me to stay connected with my family no matter where I am. It is also an opportunity for me to practice and refine the skills I learned from graduate school. I am able to carefully plan our strategy for reaching our goals without a huge loss if things go wrong. This is a low risk project, plus I get to do something that I love. Since Campa Creatives is becoming a larger part of my self-expression, I would like to feature it monthly on NiGHTandRei. For the month of October, I have been doing two things- looking for employment in San Francisco and preparing for our second party on November 12. When the job hunt gets tedious, I trade off. Some days I think my creative moments, drives around town, or window shopping actually help me focus on my career. Each day I am inspired by something new. Here are some photos I snap on these moments with my phone. Just being in the Bay Area inspires my senses. I am told that October is the prettiest time of year, and I believe it. 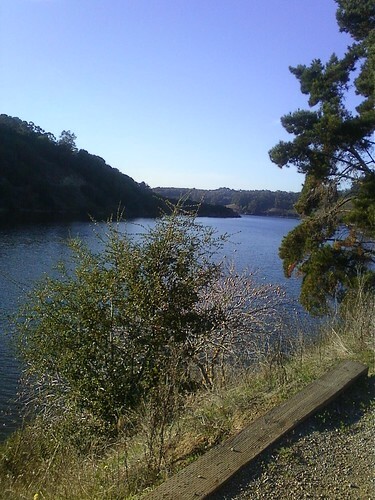 Today I went to Lake Chabot. I was amazed that this beautiful lake was only minutes from the house I am staying at in San Leandro. I sat on a bench and watched... and listened. I heard: ducks, the exclamations of young fishermen, the low rumble of a motor boat, chirping of birds, the patter of feet against the cement, gossip between walking buddies, bicycle wheels, the breeze. 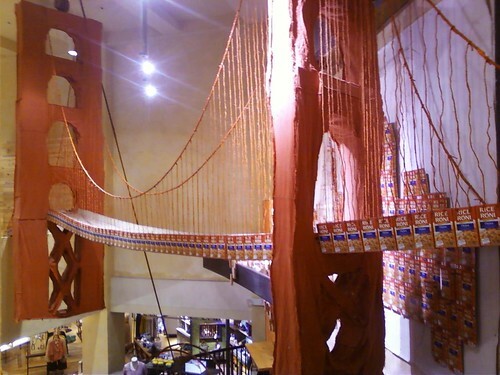 Rice-A-Roni boxes make up this art installation at Anthropologie in downtown SF. One of my favorite stores, hands down. I have been to at least 5 different locations. I am always drawn in to be inspired by the artistic spaces that they create throughout the store. I recently learned about the East Bay Depot For Creative Reuse. Just the name inspires me. Arts and Crafts meets thrift store. 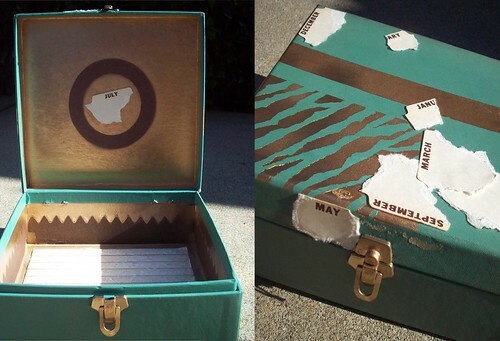 I took home this vintage teal filing box for $3.50, spray painted it gold and tore up the month tabs to make it new! During one of my wanders around SF, I discovered this unique museum on Yerba Buena Lane. Later I met a friend there and we walked through the gallery. 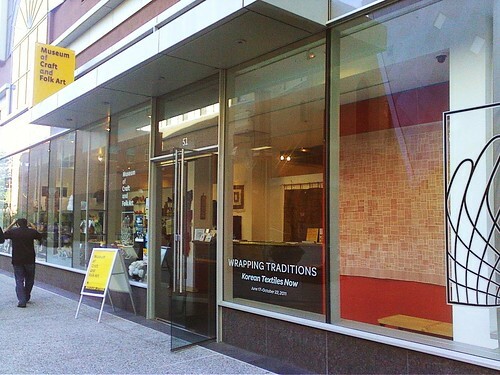 The Museum of Craft and Folk Art features some wonderful art in the gallery as well as a variety of crafts in the store. Definitely worth a drop in if you are in the area. I took a trip to the Castro Valley Library one slow day and was really impressed. It is fairly new library and features local art, cool architecture, and a lot of cozy spaces to read. I found my 'happy place' in the children's section where I spied on little ones as they read or played with puzzles. There was one group of boys playing an intense game of World of Warcraft. 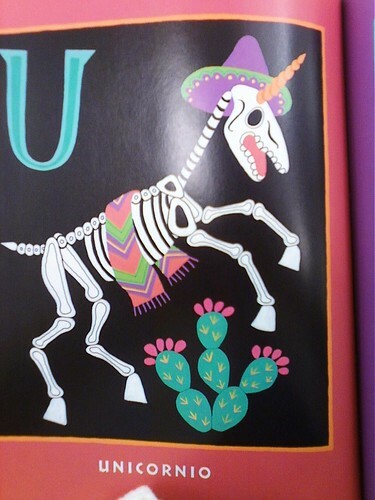 Here is a page from a Calavera Alphabet book that I took home. The art from the book inspired some of my crafts for the upcoming party! 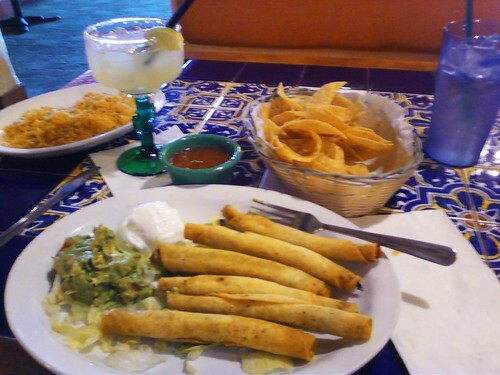 During days where I am working at home alone, I like to find a local place to grab a late lunch. If I go around 3 o'clock, the restaurant is usually quiet so I can get in some writing or just observe the space. This unfortunately blurry photo is of my delicious meal (I must've been anxious to eat it!) at Don Jose's in Castro Valley. New flavors always inspire me and I think that the colors of the food and interior of spaces I explore often influence the pieces that I create. Writing this blog really brings to my attention all of the inspiration I am absorbing each day, even though I don't realize it! I have learned to accept that these adventures are essential not only for my sanity during this slow time, but essential for my creative development and ability to appreciate what I have.